We’ve all heard emergency vehicle sirens! For some, the wail and yelp of a siren in the distance is exciting. For those who live outside the law or drive a little too fast on the freeway, the same sounds can cause feelings of doom. When used with emergency lights, sirens alert drivers of an officer’s need for the right of way on the road. Audible warning devices is important as lights because drivers will hear sirens before they see a cruiser fly by with red and blues flashing. This audible equipment is used by law enforcement, firefighters, and EMS. Here, we will discuss why sirens are necessary police tools, how the warning device has changed over the years, and the different types of sirens available from Extreme Tactical Dynamics. Electronic and mechanical police sirens are designed for use by law enforcement. Every state in the US has statutes that outline who can audible devices in their cars. The improper use of a siren can result in jail time and fines. Other first responders; including firefighters, volunteer firefighters, and EMTs, may use sirens in their fleet vehicles. While many retailers refer to sirens as “police sirens,” the same units are also used by other first responders. Today, most police cars are fitted with an electronic police siren. 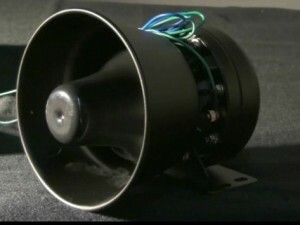 This type of siren just plugs into an existing power source. The unit can create the same sounds a mechanical siren makes. The benefit of an electronic police siren over old-fashioned sirens is ease of use. Mechanical sirens were made with many small parts and were hard to care for and use. Electronic versions are easy to care for, aren’t as complicated as old-fashioned devices, and can be turned and operated with the push of a button. Have you ever noticed some sirens sound louder than others? You probably have, and you’re not going crazy! No matter what type of vehicle a siren is mounted on, the only way to control the volume is through the PA system. The reason some sirens sound louder than others is due to the way the gear is mounted. Most emergency vehicle sirens create 110-120 decibels when turned on. Police sirens can sound louder than ambulances or fire trucks because cop cars usually have their siren mounted low on the front bumper. Fire trucks also mount their sirens on the bumper, but the large size of the vehicle absorbs some of the sounds. Since ambulances are bigger than most law enforcement vehicles and smaller than fire trucks, their siren sounds distinctly different as well. Not all police sirens are the same. Not only are mechanical police sirens still available, but electronic police sirens can vary greatly from one manufacturer from another. When purchasing sirens or speakers, you need to understand compatibility. Not all siren speakers and sirens will work together. The best way to make sure your gear works together is to read the specifications of the unit. Gear that is not compatible won’t be reliable and could void your warranty. For instance, our Remote Police Siren runs on 100-watts, which makes it compatible with our 100-watt siren speakers. If the two devices don’t match in wattage, they likely will not be compatible and shouldn’t be used together. At Extreme Tactical Dynamics, we offer siren products; including our remote police siren and two durable police siren speakers. The 100-watt remote police siren features instant-on. The unit also features a pattern selector switch, PA system and easily attaches to radio or CB systems. The unit comes with an easy to use back-lit remote control box that makes it easy to operate, even in low light. With this unit, you will be able to choose between many siren sounds including three different air horn bursts, and two mechanical sounds. The 100-watt compact police siren speaker is perfect for vehicles that are short on space. This compact police siren speaker is created with heavy-duty metal construction and comes with both wires and mounting brackets. Extreme Tactical Dynamic’s 100-watt police siren speaker is a heavy-duty, magnet speaker. 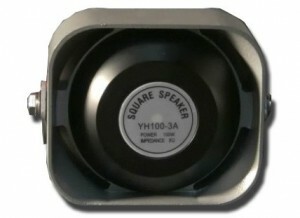 When you buy this speaker, you will receive an aluminum horn and speaker wire. When you need a siren and speaker to complete your emergency light set-up, you can trust the durable products from Extreme Tactical Dynamics.